Romitaman Original Comic Book Art :: Private Collection :: Amazing Spider-Man 282 Cover Art (1986) SOLD SOLD SOLD! by artist John Romita Sr.
Click Here To See Amazing Spider-Man #282 Comic Book! Click Here To See John Romita In His Art Studio Holding The Finished Amazing Spider-Man #282 Cover Art! Check out this "AMAZING" piece of Spider-man history! This cover art was penciled and inked by the great John Romita! Technically, this art here was used for about 30 DIFFERENT Marvel covers in 1986. Back in 1985 John Romita was asked to draw a template type border cover to be used in 1986 for ALL of Marvel's Cover art for their 25th Anniversary month in the Summer of 1986! John Romita penciled and inked 1 Marvel Cover stock board with ALL of the Marvel heroes along the left side, right side, and bottom of the cover, and the Artists on that specific title would draw the main hero for that title in the center of the cover! That's how this cover originally was drawn in 1985, with the center area blank...... But in 2006, I had an idea to ask John Romita if he would be willing to duplicate the exact pose which Rick Leonardi drew for the published ASM #282 center, but for john to draw Spider-man in his ORIGINAL COSTUME from the time John Romita was drawing Spider-Man, versus the black Spider-Man costume which was drawn for this cover. 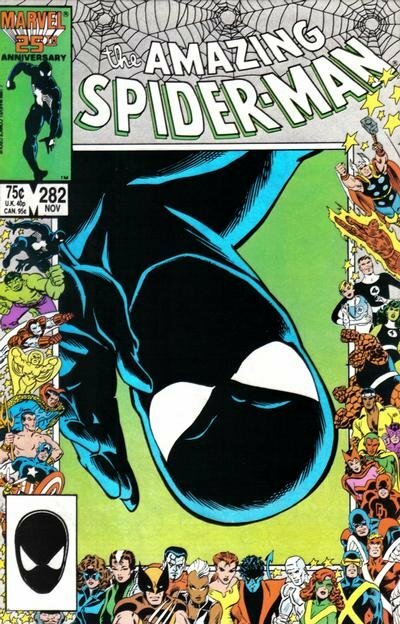 (Click the Red Link Above to see the published ASM #282 comic book to compare this incredible cover art to the published comic book) John Romita's attention to detail is beyond reproach, and he penciled and inked a PERFECT red and blue Spider-Man image right onto this cover stock board in 2006, which matches the black Spider-Man pose on the published comic book PERFECTLY. The actual Published border art has a date on the back of May 2nd 1985. (Click The 2nd Red Link above to see a picture of the great John Romita HOLDING this wonderful cover art in his studio!) Cover is signed in ink by the great John Romita also! This "AMAZING" cover right here is a MUST for ANY true Spider-Fan! ALL HIGH end pieces of art, including this one, are able to be purchased with VERY fair time payment plan options, and trades are always considered towards this and any other pieces of art on my site here! Just send me an email and we can try to work something out.